Twenty-sixteen marks Callinan Coaches Ltd.’s 21st anniversary. We travelled to their head depot in Claregalway, County Galway and met up with affable founder / proprietor Tommy Callinan to find out more about this exceptional, pioneering operation, which has been recognised at the Fleet Bus & Coach Awards for the fourth time. Voted 2016 Coach Operator of the Year for Airport Services, Callinan Coaches is a fully-licensed national and international coach hire operator providing a wide range of luxury solutions, including scheduled services, guided tours, transfers and corporate travel. Operating an immaculate fleet of modern, five-star vehicles, which offer passengers the ultimate in comfort (Wi-Fi, USB ports, air conditioning, reclining seats, DVD players, toilets etc. 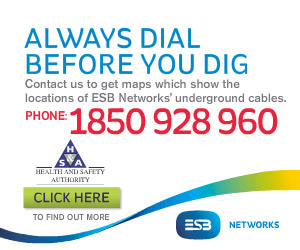 ), the business has gone from strength to strength since it was established by Tommy Callinan in 1995. The key drivers behind this success have been quality, service, reliability, comfort and economy. Since the word go, Tommy has implemented the highest standards of quality control to ensure that all customers travelling with Callinan Coaches benefit from optimum comfort levels. With a stunning fleet of state-of-the-art vehicles manned by professional, experienced and courteous drivers, Callinan Coaches make sure that every single customer is treated like a king. With depots in Claregalway and the capital, Callinan Coaches holds the City Link / Eireagle non-stop contract for services between Galway city and Dublin Airport as well as a Galway – Cork service and a Galway – Clifden service. Considering that Tommy started out on his own as an owner-driver with one coach, it is quite remarkable to think that Callinan Coaches now generates gainful employment for a team of 130. “I started working with Bus Eireann on their scheduled services and then got the City Link work,” Tommy notes. “I’ve been honoured to have secured work with Bus Eireann on the Ryder Cup as well as providing a Park & Ride service for the Ocean Race and recently for a major construction project in County Kildare. At the heart of the business is a spectacular, eye-catching fleet, currently comprising 41 coaches and eight city buses. This represents a massive ongoing investment and Tommy keeps his fleet outstandingly fresh, with no fewer than 32 band-new vehicles purchased in the past three years alone! Ten new Van Hool TX16s were purchased in 2015, as well as eleven coaches per year in 2013 and 2014. They all come with two-year bumper-to-bumper warranties and every vehicle in Ireland’s most modern coach fleet is maintained in top-top condition at all times. “A lot of money is invested in ensuring that all the coaches are modern and comfortable. We insist on operating top-quality coaches from both a comfort and operational perspective. Most of them are come with 49 seats as opposed to 53, to guarantee comfort, while we also have three Van Hool TX21 Altanos, which can offer either 70 seats or 68 seats plus one wheelchair. Through its subsidiary operating out of London (Callinan Coaches UK), tours to the UK are organised as well as ski trips to the Alps during the winter months for an independent tour company and city tours on an ad hoc basis to Paris, Brussels, Amsterdam etc. 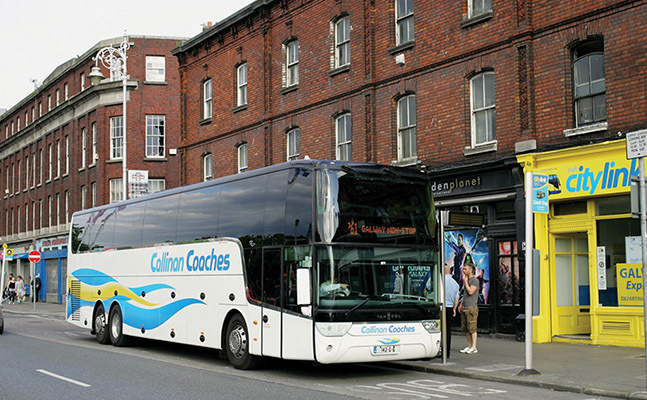 Callinan Coaches has been providing exceptional luxury coach hire solutions for more than two decades and all the indications are that this County Galway headquartered company will continue to serve the public for many more years to come. “I would be open to expanding the business further if the right contracts come along,” Tommy confirms. “Recruitment of quality drivers is one of the key issues – they are thin on the ground and that can restrict any potential growth. Having said that, if the right contract comes in, we would have no problem expanding. “We have a very small staff turnover and that has contributed to the consistency and quality of the service we provide. We run a 24-hour operation with 84 services per day and that is down to the competence and professionalism of our staff. Clearly, everything about Callinan Coaches is done to the very highest standards of excellence.